The sound from beating wet clothes against hard surface while washing dirty clothes during early morning hours was a wake-up call for Juggernaut. Yellamma was a washerwoman, she visited homes on a weekly basis to collect dirty laundry to wash and iron and bring it back within a week or so. 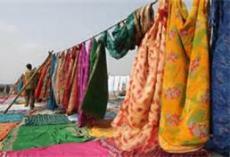 In Hindu culture people in the trade of washing dirty laundry belongs to a special caste at lower end of the hierarchy. The members of the caste live close to a river, stream or some water source where they wash the clothes the old fashioned way by soaking in soap water and beat with wooden paddles or striking the wet cloth on a hard surface like a rock or concrete slab. Some of the boulders naturally occurring on the river banks were turned into accessories in washing dirty clothes. The boulders subjected to daily harsh contact with wet clothes turned smooth all around from weathering. From regular shoulder movements in washing heavy loads, the upper body muscles of washermen and women look more of gymnasts working on parallel bars. Washed clothes were dried in the hot tropical south Indian sun. In the years past, donkeys were used to carry the loads to and from the river after cleaning and drying or sometimes the washermen ad women carried on their own back. The people in the traditional laundry trade developed hunch-back from chronic bending of their backs while carrying the loads.Yellamma owned a large piece of land in the urban area. On the periphery of her property were wooden shacks with thatched roofs that housed her men and women worked for her. A shallow water well at the center of the property served as water source for washing. A cluster of slant concrete slabs grounded deep into the ground were spread out on the property each like a work station to wash the clothes. The intense manual force that brings wet clothes in contact with the concrete slab generates sound that resembles firecrackers going off simultaneously. The sound from the synchronized washing was daily wakeup call for the school children and workers early in the morning to get ready for a commute. Before the sun rise, the men finish washing the clothes to hang them to dry on steel wires stretched between bamboo poles erected crisscrossing the property. Colorful saris and other garments hanging from the network of cloth lines appear more like an international flag festival. By mid afternoon, the clothes were dry and ready for ironing. The ground at the washing area was turned into swamp from washwater discharged onto the ground over the years. The workers walk bare footed on the mud carrying the loads on their head as if living in a rainforest. In the afternoon, the workers iron the clothes with a heavy steel or brass iron each weighing at least 10 pounds. Burning hot coal was placed into the iron by opening its top compartment. The hot temperature and heavy weight of the iron in combination was necessary to straighten out the wrinkles on rough cotton fabric. In front of each wooden shack was an open iron pot with burning coal to supply hot coal for the iron. It was common to see some pedestrians on the street stop by to light their cigarettes on the burning coal in the open pots. At one corner of the property was a small temple with village deity Yellamma, the namesake for many women in the area. The washerwoman Yellamma was named after the deity. Once a year, believers gather to celebrate the deity of Yellamma. Folk singers and dancers perform in front of the temple to please the crowds, merry go-round and other rides provide entertainment to the children and vendors sold everything from colorful clay figurines to paper dolls. The open air laundry turns into fair grounds with crowds walking up and down. In the evening, the washermen and some women drink Toddy brew Kallu to get drunk and quarrel. Yellamma, the matriarch love to drink; she was a habitual drinker though never gets drunk; one can smell alcohol in her breath all the time. A conversation with her was like a shouting match; not that she was an angry person but she was loud. She got used to shouting at her men and women from a distance all day long and with her customers she spoke with same loud voice. With muscular shoulders developed from carrying big loads and unruly grey hair falling all over her face flushed red from chronic drinking, she looked more like a ferocious lioness. Customers seldom argued with her over the laundry charges or a missing piece of their laundry. With no customer dare to question her, on occasions she randomly pick and choose to wear beautiful saris belongs to her customers. After decades of running laundry business from her property in the urban area, Yellamma cashed in on selling her land to the land developers eager to build a shopping center. She moved her operation to the town’s out skirts near a water stream. The people in the area missed the early wakeup call, the synchronized sound of washing and evening loud brawls between the drunken washermen. This page was created in 0.5242 seconds.